Last month, as I was watching the news coverage of President Obama's visit to Turkey, I thought back to an awkward experience I had as an undergraduate student applying for a job at my university. When I handed the receptionist at the student union my Social Security card, a required form of identification, she told me she needed my passport as well. Surprised, I questioned the need for it. 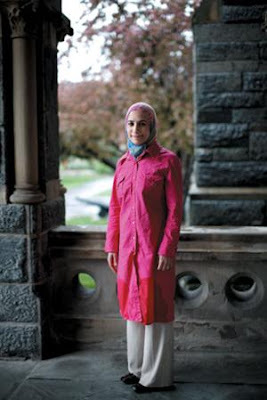 She brought over her supervisor, who glanced at my hijab—a headscarf worn by many Muslim women—and asked, "Aren't you an international student?" "No," I said. "I'm an American citizen. I was born in New Jersey." Her mouth dropped open and she stammered, "Oh, you're not a foreigner?" It was not a new experience for me, as a Muslim growing up in this country. Before people learned my name, saw me run at a track meet or heard me debate an argument, they assumed they knew who I am. That's why Obama's decision to visit a Muslim country within the first 100 days of his presidency was such a significant moment for me. Hearing his unwavering, unapologetic message to the Turkish Parliament filled me with pride: yes, he told the world, Muslim Americans exist, and our existence has enriched—not impoverished—American culture. His words mirrored what I have long sought to convey to other Americans: that you can be both a devout Muslim and a patriotic American. I can only hope my fellow citizens get the message. When many Americans see Muslims like me, they tend to define us as something non-American, which forces us to choose between our religion and nationality. As long as Islam is equated with a foreign culture, as opposed to a faith like any other practiced here, then our mosques and our schools and our headscarves will continue to be perceived as a rejection of "American culture." This idea of Muslims as "other" surfaces every time someone like my friend Kathy, a veil-wearing Muslim American, is told to "go back home" when she and her daughter eat at Subway, or when a man plows his truck into a Tallahassee, Fla., mosque to remind Muslims they're not safe in this country.